Keith Lionel Urban (born 26 October 1967) is an Australian country music singer, songwriter, guitarist, entrepreneur and music competition judge. In 1991, he released a self-titled debut album, and charted four singles in Australia before moving to the United States the following year. He found work as a session guitarist before starting a band known as The Ranch, which recorded one studio album on Capitol Nashville and charted two singles on the Billboard Hot Country Songs chart. Still signed to Capitol, Urban made his solo American debut in 1999 with the album Keith Urban. Certified platinum in the US, it produced his first number one on Hot Country Songs with "But for the Grace of God". "Somebody Like You", the first single from his second Capitol album, Golden Road (2002), was named by Billboard as the biggest country hit of the 2000s decade. The album's fourth single, "You'll Think of Me", earned him his first Grammy. 2004's Be Here, his third American album, produced three more number 1 singles, and became his highest-selling album, earning 4× Platinum certification. Love, Pain & the Whole Crazy Thing was released in 2006, containing "Once in a Lifetime", as well as his second Grammy song, "Stupid Boy". A greatest hits package entitled Greatest Hits: 18 Kids followed in late 2007. Defying Gravity and Get Closer were released on March 31, 2009 and November 16, 2010 respectively. In September 2013, he released a brand new album titled Fuse, which produced four more number ones on the newly introduced Country Airplay chart. Two are those number ones are duets with Miranda Lambert and Eric Church. A new single, entitled "John Cougar, John Deere, John 3:16", was released in June 2015 and will serve as the lead-off single to his upcoming eighth American studio album. Urban has released a total of nine studio albums (one of which was released only in the United Kingdom), as well as one album with The Ranch. 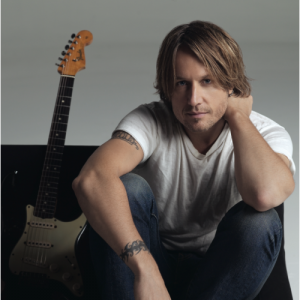 He has charted thirty-seven singles on the US country charts, of which eighteen have reached number one (counting a duet with Brad Paisley and the 2008 single "You Look Good in My Shirt", which Keith Urban himself previously recorded on Golden Road). Those number-ones also include his third Grammy Award winning single "Sweet Thing", from his album Defying Gravity. Urban is also known for his roles as a coach on the Australian version of the singing competition The Voice, and as a judge on American Idol. Since 2006, he has been married to actress Nicole Kidman. In October 2013, Urban introduced his own signature line of guitars and accessories.